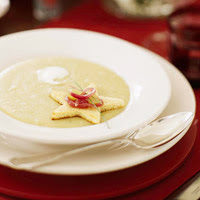 The beauty of this soup, in addition to the leek and bacon flavor, is its make- ahead option. Prepare it in advance of any Christmas celebration. Preheat oven to 425 degrees F. Place garlic cloves in custard cup; drizzle with olive oil. Cover with foil. Roast in oven 25 to 35 minutes or until cloves feel soft when pressed; set aside. Meanwhile, in Dutch oven cook bacon over medium heat until crisp; drain on paper towels. Crumble bacon; set aside. Cook leeks in bacon drippings about 5 minutes or until softened but not browned. Add broth, water, potatoes, salt, and pepper. Bring to boiling, reduce heat. Simmer, uncovered, 10 to 12 minutes. Stir in garlic. In food processor or blender container, pour half the soup mixture. Cover; process until smooth. Repeat with remaining soup. Return soup to Dutch oven. Add bacon. Heat through. Thin with water to desired consistency. Ladle into bowls. Top with sour cream. Float Toasted Stars. Sprinkle chives. Makes 8 (1-cup) servings. Three days ahead prepare soup as directed through step 5, leaving out crumbled bacon. Cover; refrigerate. Two hours before serving, transfer soup to saucepan; reheat over medium heat about 10 to 15 minutes or until bubbly, stirring occasionally. To keep warm transfer to slow cooker set on warm.To serve, stir in bacon. An immersion blender is a handy tool to have for blending soup without transferring it to a blender. Calories 224, Total Fat 13 g, Saturated Fat 4 g, Monounsaturated Fat 6 g, Polyunsaturated Fat 2 g, Cholesterol 19 mg, Sodium 627 mg, Carbohydrate 20 g, Total Sugar 2 g, Fiber 2 g, Protein 7 g. Daily Values: Vitamin A 0%, Vitamin C 26%, Calcium 3%, Iron 7%. This entry was posted on 1:57 AM and is filed under Soup . You can follow any responses to this entry through the RSS 2.0 feed. You can leave a response, or trackback from your own site.